MANILA, Philippines - Team Sarah artists clashed in "The Voice Philippines" last battle round on Sunday, December 21, 2014. It was a battle of vocals between 4-chair turner and theater actor Poppert Bernadas and church singer Jireh Singson as they performed Nexxus (band) hit "I'll Never Go." Coach Sarah declared Poppert as the winner in the battles round. He will advance to the next round of the competition – the Knockout rounds. None of the coaches attempted to steal Jireh from Team Sarah. In the second season of the show, the eliminated artists may get a second chance if another coach decides to steal them. If two or more coaches want to steal a losing artist, it’s up to the artist to choose the team he or she wants to join. A coach may only steal two artists throughout the battle rounds. 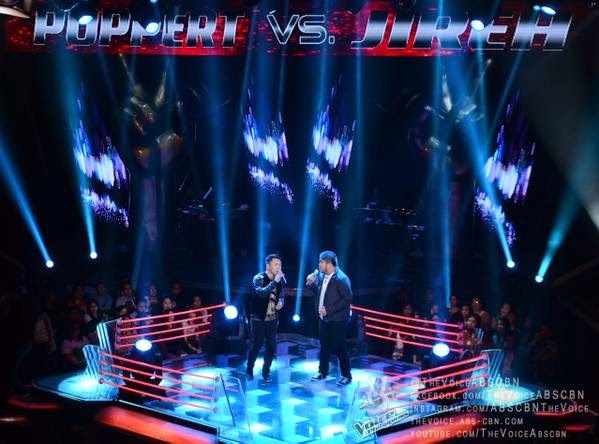 In the knockout rounds that will kick off next week, expect an unexpectedly tougher competition on “The Voice of the Philippines” stage, as two artists from each team will again be pitted against each other by performing a song of their choice. But unlike in the battle rounds, the artists won’t immediately be informed about who their contender is going to be. The second episode of The Battles on Sunday dominates online conversations with '#FinalBattlesPH' among the trending topics. "The Voice of the Philippines" Season 2 is hosted by Toni Gonzaga and Luis Manzano, with Alex Gonzaga and Robi Domingo as V Reporters. Don’t miss “The Voice of the Philippines” Season 2 every Saturday at 8:45PM and Sunday 8:30 PM on ABS-CBN.